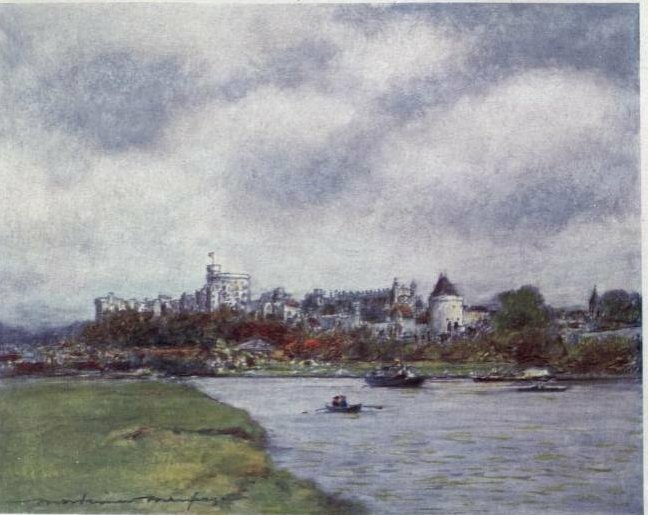 Windsor by Mortimer Menpes, R. I. The town has always been subordinate to the castle, for it was the castle that caused the town to spring up, as there were always numbers of artificers, attendants, grooms, workmen and others needed for the service of the Court. In the fourteenth century it was reckoned that the Court employed an army of 20,000 of such people. These would all have to be housed somehow, and the nearer the protection of the castle the better; hence the town on the slopes. There, wrapt in clouds, the bluish hills ascend.